Oh, Magoo, you've done it again! The bumbling, mumbling, myopic and eccentric millionaire has entertained generations of fans. Voiced by Jim Backus (Gilligan's Island), he's been a hit since he was first introduced in 1949. 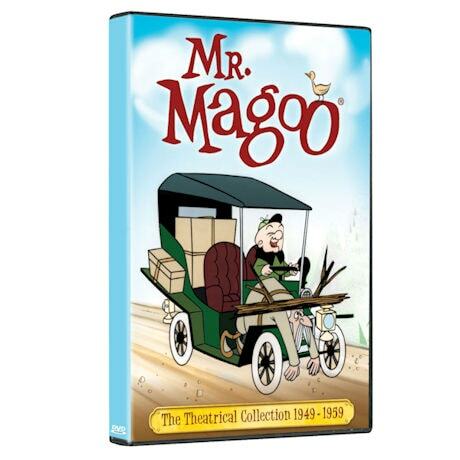 This collection includes all 53 Magoo theatrical cartoons (12 in widescreen for the first time) and the feature film 1001 Arabian Nights, in which we meet Magoo's ancestor (and Aladdin's uncle) Abdul Aziz Magoo. 7 hrs, 4 DVDs. This collection includes all 53 theatrical cartoons, including 12 cartoons in anamorphic widescreen for the first time, and the feature film 1001 Arabian Nights.